It was primary education time, and on your day off, you had gather the pressure-cooker, pan lids, wood spatulas, two plastic bowls and the cheese grater together. All that stuff was balanced on wood sticks or fixed with rope. You've placed your seat in front of this paraphernalia, and there you were the King Of Drums, bashing each lid or bowl. And, to your ears, it sounded like the best drums look-alike. Nowadays, with your computer, it's possible to feel that kind of live emotion again. And we don't speak about assembling lids again, but to rediscover the pleasure to play drums at home, with a sound that clearly competes with pro studio recording sessions. 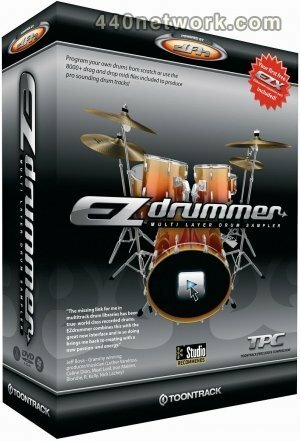 EZDrummer is a plug-in (AU, VST and RTAS, Mac and PC), which allows to play and program drum sounds and parts, and read MIDIfiles of drum grooves in a very original, intuitive and easy to use way. The audio engine plays drum samples, which have been carefully recorded and mapped in different kits. Each drum kit is dedicated to a particular musical genre, era or style : disco, traditional, rock, jazz, etc. If you want to widen the sound palette, you have to buy EZXpansions, proprietary expansions of sounds and grooves. I've installed three of them, in addition to the included Pop/Rock and Cocktail : Drumkit from Hell, Latin Percussion and Vintage Rock. One word about the size : Toontrack uses a proprietary lossless compression, the Toontrack Percussive Compression. You'll find more infos on their site, but TPC allows to drastically reduce the size of libraries : thus, the factory library size should be 5 GB if uncompressed (16 bit/44,1 kHz data). A kind of muffled kit, ideal for vintage grooves. [/BLOCK] You have to wait a little while loading a kit, up to 30 seconds for the bigger sets. A progression bar shows loading state and kit size. EZDrummer uses different backdrops, changing to match the current loaded kit. You can click on drum elements to hear their sound, thus verify you've loaded the one you're looking for. Clicking on the elements pictures shows their sound quality, but it's even obvious when playing them from a keyboard or a drum pad, thus you can hear the subtile velocity-dependent sound variations. A "question mark" button opens the manual, kit description, mapping charts, flash tutorials, online help, etc. This help section is clear, didactic, and allows to perfectly comprehend the software. Congrats to Toontrack. A Humanize function adds variations to the hits, avoiding the usual and unwanted "machine gun" effect. Mapping correspond to the standard MIDI mapping : kick on C, snare on D, closed, pedal and open hihat on F#, G# and A#, etc. Beware, the included grooves use a more complex mapping, and will be hardly usable with another drum software. There's also a convenient Velocity parameter, which fine tune sound's response to velocity. It's helpful to adjust to one's strenght, and it's also handy to precisely set EZDrummer response to an electronic drum kit or drum pad. I've tested EZDrummer with such a kit, and the result is... striking ! I've encountered some latency, and couldn't really find out if it cames from the Pro Tools/EZDrummer couple or from my trgigger rack. As I didn't have any latency when playing from the keyboard, I assume the problem is material related, my trigger rack being kind of a vintage piece (an Akai ME35T). When you will be tired to hit your drum pads or keyboard, Grooves button will allow you to take a rest. For each kit or EZXpansions, corresponding grooves libraries are available. You simply have to navigate thru the thousands of grooves, loops and fills, then press the Play button to hear them, and find new ideas. Note that tempo can be halfed or doubled directly from the interface. But enough talks, let's have some audio examples. I've used one of the two factory demo patterns, then drag'n'drop it on a Pro Tools track. I go back to my first kit, Pop/Rock, and edit my MIDI track, modifying some notes and quantizing to eighth notes, thus giving a "tighter" groove. Then, all I have to do is to shift back and forth some snare notes to have a more "groovy" pattern. This pattern is of course always readable by EZDrummer. The Mixer button opens a mixing console, where you can adjust independent levels, pan, Mute, Solo, etc. The number of channels may vary depending on the loaded kit, from six (Cocktail) to 14 (Latin Percussion). There's usually all instrument channels, plus Room, Overhead and sometimes Comp Mix (parallel compression). You can choose between Drummer (behind the drum kit) or Audience perspective (in front of drum kit). Roomy, which emphasize the sound of the drum room. Dry and Semi-Dry deliver a proximity sound, with or without mike bleeding. Flat, which set all faders to 0 dB. If you want that kind of "clean" sound used on some productions, you could choose to de-activate the bleeding between microphones, for the B mike on the Snare, or the Overhead. When used as a plugin, EZDrummer can be set in stereo or multichannel mode. This last mode offers 8 stereo Out, and each mixer channel can be independently assigned to one or the other Out, to mix with external plugs (EQ, compression, reverb, etc. ), for instance. This plug is one of the easiest to use and it offers an excellent sound quality. Kits are well detailed, complete and original, even if it's a bit annoying to wait for long seconds while they are loading. It's power relies in its simplicity, its ergonomy, in the sound quality and versatility of the drum kits, in its expansion abilities and the possibility to use its MIDI patterns as starting points in our favorite sequencer. EZDrummer, simple, efficient, intuitive and elegant. It's worth a try !